Entertainment and innovation take a whole new turn in Skywind’s Respin Mania. If you’re a fan of the classic Vegas casino-themed slot and like the idea of a modern take on this traditional genre, then Respin Mania is definitely the game for you. This 25-line, 5-slot reel video game has many bonus features and free spin modes that will keep you entertained throughout. Respin Mania offers a minimum bet of € 0.25 and a maximum of € 250. Moreover, bonus features can help a player get free spins and re-spins, the game’s most notable and intriguing feature. Once you play, you will realise that Respin Mania is a slot game which works in the players’ favour, offering many features that can help them win a higher payout amount! Respin Mania uses the traditional symbols of a classic Vegas casino slot machine, including traditional fruit machine symbols, including red sevens, bars, bells and cherries. Respin Mania also features the king, queen, jack and 10 symbols. This video slot game has turbo-play feature, which allows a player to speed up the spins. Another feature a player can use is the autoplay feature that lets them enjoy a hands-free gameplay, playing spins automatically. Speed and efficiency are two of the main benefits this video slot game offers. The game is known for its many bonus features, particularly its free re-spin mode. In Respin Mania, the scatter symbol is the diamond symbol. Depending on how many diamonds land on the screen, the free spin round is triggered. This rewards players with free spins that help boost their winnings. This video slot game also features a wild symbol which can substitute all other symbols except for the scatter symbol, allowing a player to form more winning combinations. While the scatter symbol and the wild are great bonus features, the best feature on Respin Mania is probably the free re-spins feature. Each time a player wins a spin, the winning symbols are locked on the screen and a free re-spin is offered. If the player wins once more, the new winning symbols are locked on the screen and another free respin is triggered. This feature continues to be triggered so long as the player wins each re-spin round. Another way to trigger the free re-spin is by hitting 4 or 5 diamonds on the reels — this means that the free re-spin mode can be triggered aside from when a player wins the free spins round. Bonus rounds add excitement to modern video slots and the re-spin feature undoubtedly proves to be the most intriguing and well-liked feature on Respin Mania. It is definitely enough to encourage anyone to give the game a go! Payouts in Respin Mania are one of the most favourable elements of this game. With a maximum payout of € 20, this video slot game continues to capture the interest of any player. Cherries award up to 200 coins. The wild and the diamond are the only two symbols that don’t award any payouts (but hey, they do other great things!). Nevertheless, it is important to note that while they don’t directly offer payouts, these two symbols offer bonus features and free spins which greatly help in increasing the potential payout for the player. At a first glance, one will immediately notice that Respin Mania is the classic Vegas-themed slot game with a sophisticated and modern twist. The five-reel slot is displayed at the centre of the screen, with a purple and blue background featuring moving stars that gives it a futuristic, space-age feel from a retro perspective. The 3D symbols add to this innovative modern take on the Vegas slot game and the background music also complements to the classic theme of Respin Mania. If you’re ready to take on a game full of fun and excitement, this twist on the classic slot is what you’ve been waiting for. 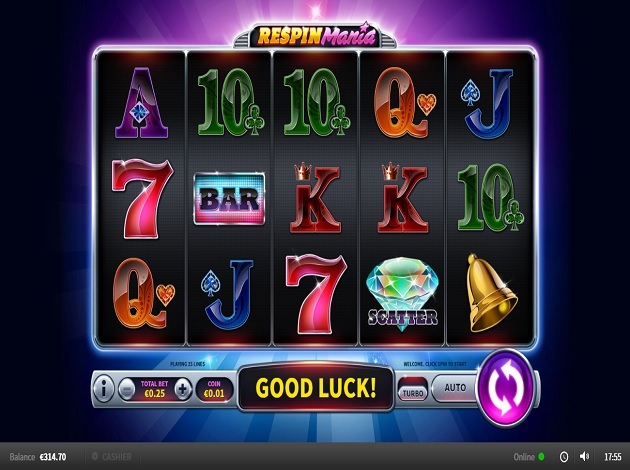 Respin Mania is full of bonus features and free spins which make the gameplay extremely entertaining. The re-spin feature alone is enough to convince any player that Respin Mania is both exciting and intriguing—this bonus feature is unbeatable.